Check out our assembly PowerPoint! This week, the children have impressed us with their focus and perseverence as we completed some mock papers. The children’s attitude has been brilliant and we are seeing some great progress. In Science, we have been learning about how rainbows work and in English, we have begun to analyse a new Michael Morpurgo text called ‘The Giant’s Necklace’. 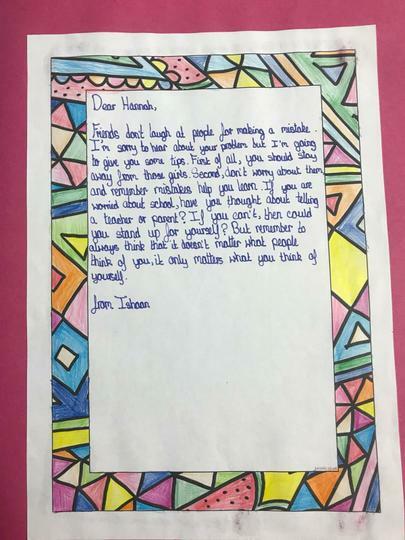 It has been great to see some of the amazing work that has been created as part of the grid homework for this half term, and to see how the children have used the activities to think about self-love and care. This week we have been looking at Adrian Gibbons' short film 'The Piano'. It is a silent film which depicts the major events in his life. They come to life through animation and music. The children have been contemplating his feelings and emotions at these different points. Next week, we will be writing our own narratives based on this film. In Maths, we have been revising key concepts; calculating the mean, analysing graphs and translating and reflecting shapes. The children have been working very hard with the increased number of Maths and English lessons. The Year 6 children produced some fabulous pieces of work based on the book 'The Whisperer'. Thank you to all of those who visited the exhibition. First week back after the half term and we have been very impressed with the focus and effort of our Year 6 children. This week, in Maths, we have covered a range of topics in order to revise and develop some new skills. We have covered how to use the long method of division, how to use negative numbers and how to multiply and divide fractions. In English, we have completed our persuasive letters relating to evacuation in World War II, creating some very powerful texts. Later in the week, we read the whole school book called 'The Whisperer' and have begun to delve into some of the themes of the story. 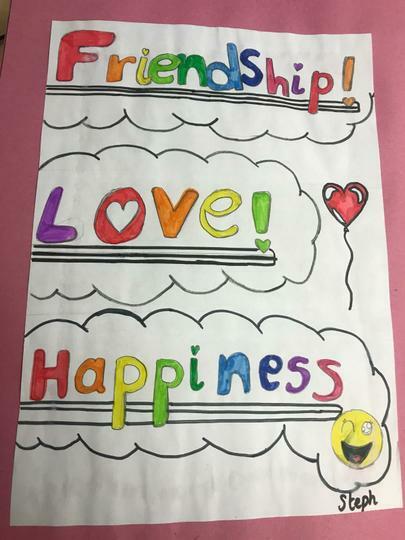 New homework grid was handed out this week full of self-love activities. This week, we were lucky enough to have a workshop which educated us all on internet safety. We took part in a session called 'Game Over', where we had to complete activities in order to move through the levels. These thought-provoking activities opened our eyes to the effects of playing games too often and what we could do to ensure our well-being when playing games. We then thought about how to remain safe when online and how to how to report any concerns. In Maths, we continued our learning about 2-D shapes by revising the parts of a circle and the relationship between the radius and diameter of a circle. In English, we planned, and began to write, a narrative based on the life of a child evacuee in WWII. We looked at using some complex punctuation and using senses to describe in order to create some emotive writing. Grammar book - pages 58-61 due in Tuesday 5th February 2019. Homework grid homework is due this week - Friday 8th February 2019. Another busy week for our Year 6's. This week we were able to progress our learning of World War II through attending our trip to the RAF museum. The children enjoyed their experience at the museum, and in particular the WWII classroom experience. In this, we were able to experience what school life would have been like for a child during the war, and the protocol for when an air raid siren sounded. We then had a chance to view some of the aircrafts used and learn about the role that they played in the war. In Maths, we have been learning about 2-D shapes and how to classify them based on their properties. This included looking at types of triangles and quadrilaterals and using mathematical terminology to describe and sort them. In English, we learnt about the Blitz and began writing some setting descriptions of London during this time. We discussed and empathised with how people living there would have felt and what they would have sensed. We also began to infer feelings through our texts, explaining our physical reactions based on emotions. Maths - Pages 66 and 67 in the CGP books. Happy New Year! And what a great start to the year it has been. We started the week with quite a bang... the year 6 team (with some help from Miss Kneller) organised a surprise 'evacuation' experience on Monday morning to kick-start our WW2 topic. It's fair to say the children were rather shocked and some quite concerned to be told they would have to be evacuated, but they were quickly told that it wasn't real. Instead, we spent a lot of time reflecting on their thoughts, feelings and emotions, exploring how real children who were evacuated would have felt. This led to some excellent exciting writing- some children produced a diary entry of the experience whilst others wrote a newspaper report. In maths, the children have been finding the area of triangles and parallelograms using formulae. Why not see if your child can remember the formula for the area of a triangle (base x height divided by 2) or a parallelogram (base x height). They will need this for their homework this week. In Science, we have started a new topic on 'light'. This week the children learnt how light enables us to see. In the next few weeks, the children will be creating periscopes using cereal boxes- please make sure your child brings in a clean and empty cereal box by Wednesday next week. This week's homework is CGP Maths p.60-61 (area of triangles and parallelograms). Spring 1 grid homework has also been set- a copy of this can be found at the top of this page. This week, the children enjoyed completing their English work based around the Christmas Truce. They began with some drama (hot-seating soldiers from the Christmas Truce) and then produced a script for a radio report for the main events in the story. Year 6 certainly have some excellent actors and actresses which enabled both classes to generate some really thoughtful ideas. In maths, we completed our unit on multiplication and the children's holiday homework is to practise the different methods they have been learning, applying these to different types of questions. We also completed our rainforest topic by looking at the importance of the rainforest in the lives of people living there as well as modern society. 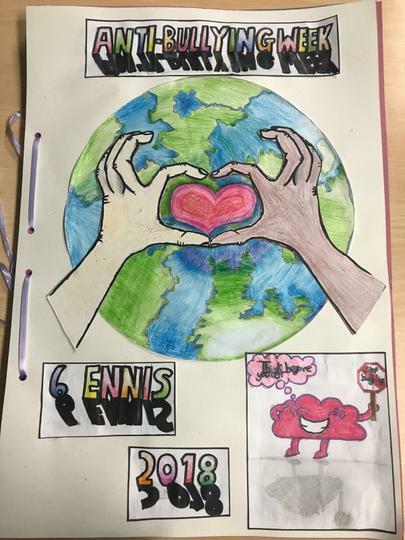 Some of the children produced posters to make people aware of the impact of deforestation. Spelling- the children have a booklet of spelling activities to complete based on the year 5/6 word lists. We hope you have a really wonderful and magical Christmas break. May we take this opportunity to say a big thank you to both parents and children for our lovely Christmas presents! This week began with a well deserved treat, in which we were able to visit the local cinema and watch the new Fantastic Beasts film. This was a great way to start our week. Later in the week, the children began to learn about the Christmas Truce which took place in World War I. We have investigated the truce and what it consisted of. A few parents have been asking for recommended reads for children in year 6, especially books which will stretch their vocabulary and challenge their comprehension skills. Thank you to our fantastic librarian Mrs Storms for creating an awesome list of 'must reads' for children in year 6. Check it out above! This was a great week for the children to be able to showcase their knowledge and skills to the adults that work with them. The children have impressed us with their attitude and focus across the week. 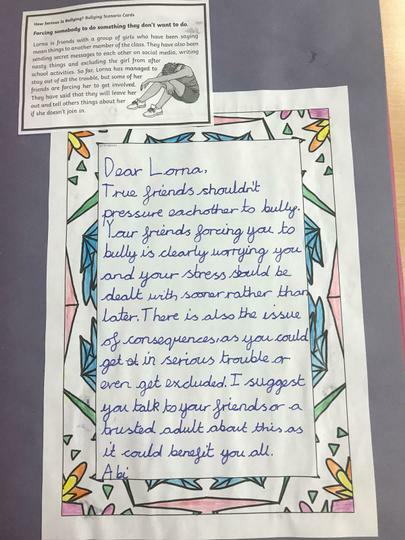 This week, the children have produced some brilliant work around the theme of anti-bullying. They have created some agony aunt styled texts where they have offered advise to some fictional characters. 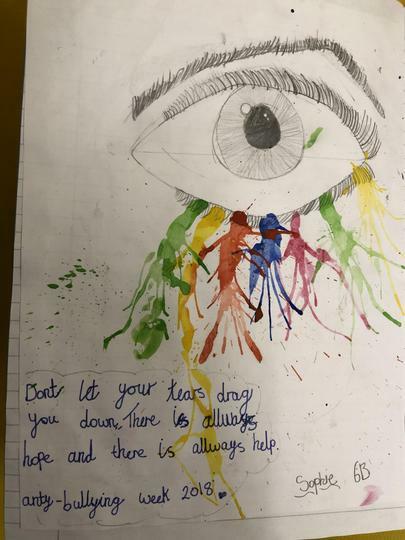 This is accompanied by some beautiful artwork in our class books which can be found on display near the main entrance of the school. Some examples of the work produced can be seen below. This week was Road Safety Week. Children in years 5 and 6 had the opportunity to take part in a Bikeability course and all of the children involved passed with flying colours! We had such excellent feedback from the instructors that we may even run another course in the Summer term. Watch this space! It was wonderful to see staff and pupils dressed in their pyjamas and onesies today in order to raise money for Children in Need- a great end to Anti-bullying Week! During the week, the children were visited by the NSPCC who talked about keeping themselves and other safe by speaking out. Next week, year 6 will take part in a workshop to continue their learning related to the assembly. 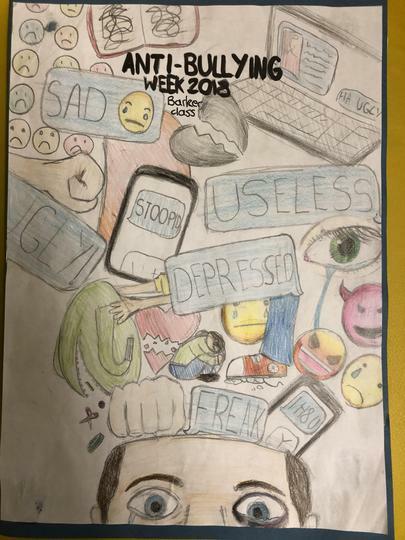 They will also link their writing in English to Anti- Bullying Week. Homework this week is to learn lines for the upcoming assembly. As this is the only homework being set, children are expected to know their lines by heart for Monday and to have prepared any cue cards they may need. We hope you you have a good weekend! This week, year 6 have spent time reflecting on their exciting weeks at PGL and taking part in the Enterprise project. 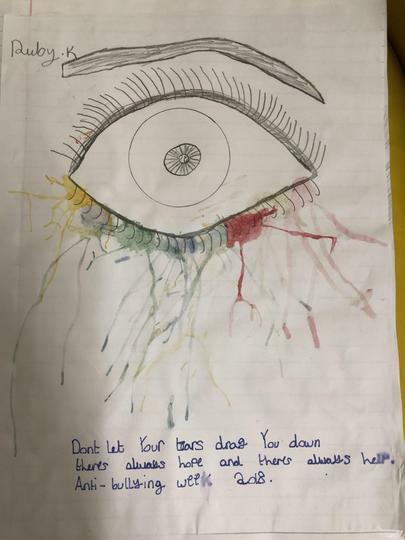 In English, the children have been writing persuasive texts, looking at a variety of persuasive techniques including: use of imperative verbs; use of personal pronouns, using groups of 3; using emotive language and use of rhetorical questions. They have thought of a place that excites them and have begun to write articles which persuade others to go there. Lots of children have chosen to write about PGL and others have written about countries or clubs that they like. These will be completed next week. Our maths focus has continued on fractions. The children are becoming confident using a range of strategies to compare the size of fractions with different denominators and are beginning to develop their reasoning related to this. In topic, the children continue to develop their understanding of rainforest and this week, have explored the climate of the rainforest, linking their learning with maths by creating graphs and charts of rainfall data. Grid homework has also been sent out today. 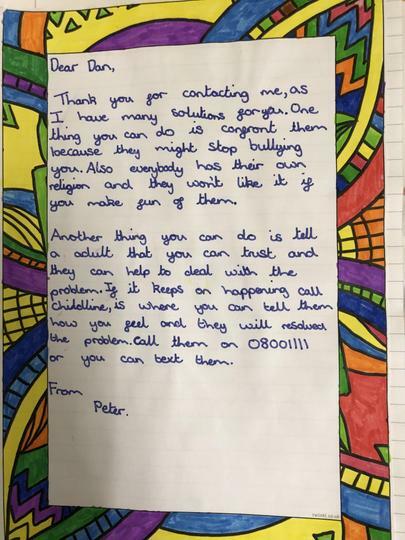 We had some amazing homework from a number of pupils last half term, however, we were disappointed to see a large number of children who did not bring in anything. Next term, we expect all pupils to bring in the allocated 5 pieces of grid homework (one of which must be Maths Whizz). Where homework is not completed, children will be given time during lunchtimes to get this done. We thank you for your support. This week a group of year 6 children embarked on an enterprise experience. They were given £5 to start a business and see how much money they could raise for charity. They chose 3 charities (WWF, Macmillans Cancer Support and Children in Need) to donate their profits to. They quickly set to work thinking of ideas and researching costs before presenting their business plans to Miss Kneller, Mrs Walker and the rest of the class. 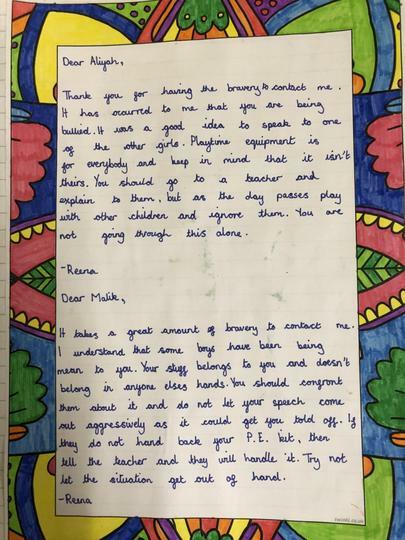 Some children even managed to get the backing of some Investors (thanks Mum and Dad). We then had a fun trip to the retail park and Tesco, in order to buy all the materials they needed and have a pit-stop for more 'brainstorming' and hot chocolate. Once back at school, they were keen to start making their products, marketing them and decorating their market stalls. Despite some much needed breaks for yoga and music workshops, and with the help of great teamwork, they managed to finish ahead of schedule and were rewarded with a film and treats! Their marketing paid off and before long we had over 160 children signed up for sale day! It was a frantic day but the children kept smiling throughout and didn't stop until every last item was sold! They managed to take an impressive £199.75 on the day, leaving them with nearly £60 of profit for each of their chosen charities. We are so proud of all they have achieved and their fantastic attitudes. We can’t believe we’ve come to the end of our fantastic week at PGL. This morning, the children were lucky enough to take part in two final activities- trapeze and challenge course- which the children thoroughly enjoyed. They are certainly going to have lots of stories to tell when they get home! Before we left, we were told how much the children would change over the course of the week and now we can see that. The Summerswood staff, as well as PGL staff, have been so impressed by the children’s ‘can do’ attitudes; the way they have overcome their fears and they way they have worked together as a team. We are very lucky to teach such a great bunch and look forward to returning them to you with wonderful memories that will last a lifetime. Have a great half term! It was a chilly start to the day today but despite that, the children had another day full of adventure and some big challenges were overcome. Activities today included: canoeing, zip wire, problem solving, vertical challenge and aeroball. The day was finished off with lots of dancing at the disco! The children have had a wonderful time and are looking forward to tomorrow morning’s final activities! More pictures to follow. It’s been an action-packed day at PGL for year 6. Abseiling, archery, raft-building and Jacobs Ladder have really tested the children’s ability to overcome their fears. There have been some incredible feats of bravery and resilience, as well as excellent teamwork. It’s amazing what you can achieve when you put your mind to it! We are so proud of the children and all they have shown us so far- we can’t wait to see what the rest of the week has in store. 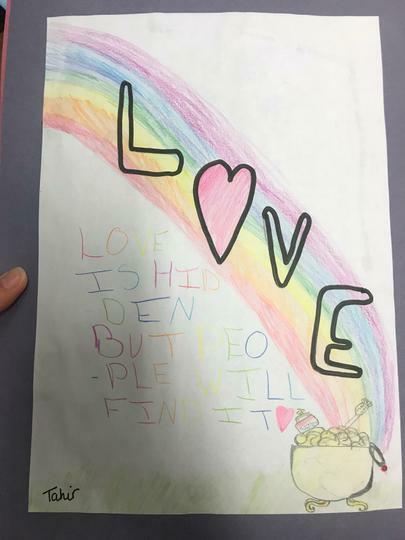 In English, the children have been writing narratives with a genre twist related to Kensuke’s Kingdom- we’ve seen some fantastic descriptive techniques used which the children have learnt in previous weeks. In maths, we have focussed on problem solving and looked at a variety of strategies including working backwards and prioritising information. In topic, the children have been looking at layers of the rainforest and have gathered lots of facts to include in an information sheet which they will complete next week. This week’s maths homework is based around rounding and estimation which are other skills we have been practising this week. It’s due on Tuesday. Grid homework has started to come in this week and we have had some amazing models and posters. Don’t forget, the 5 pieces of grid homework set this half term are due on Friday 19th October. Can you believe we have reached the end of September already? Time really does fly by at Summerswood! The children have enjoyed another week of English based around Kensuke's Kingdom, writing postcards from the island as well as some amazing setting descriptions. 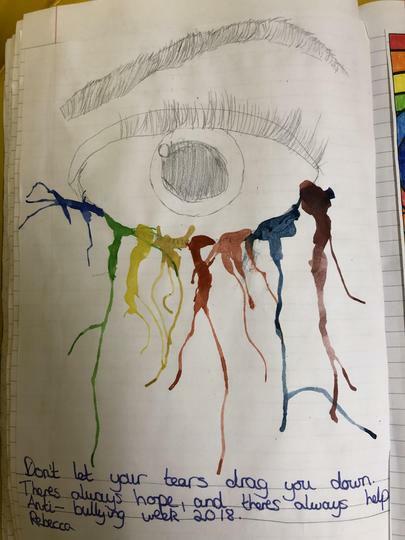 We have been blown away by the children's imaginative descriptions and use of a variety of descriptive techniques. In maths, we have been focussing on mental strategies and choosing the most efficient strategy. Today we looked at using rounding to estimate answers to help us when checking our work. Aside from the core subjects, the children have also enjoyed mindfulness lessons, Game On and designing their own thematic maps of the Amazon Basin in topic. Maths- Mental calculations due on Tuesday. Don't forget to keep up with Maths Whizz which is part of this half term's grid homework. Please remember, spellings will now be set on a Tuesday and are due in the following Tuesday for a test. PGL information (slides from this week's meeting) including kit lists will be added next week so keep an eye out! The children have continued to impress us with their attitude towards their learning this week. In English, we have, again, been writing recounts in the form of 'Ship's Logs', but this time, from the perspective of a different character from the book, Stella the dog. The children have been extremely creative in this writing, using some great description and focusing on Stella's different senses. In Maths, we have been continuing to develop our understanding of place value and have been recapping some vital skills that will be needed throughout the year. We look forward to seeing those of you who will be attending the final PGL meeting on Tuesday 25th. Spelling- -ant, -ance and -ancy. Maths and spelling are due on Tuesday. Spellings will be tested on Wednesday. We have reached the end of our first full week! The children have shown us some excellent attitudes towards their learning. In English, we have been writing recounts in the form of 'Ship's Logs' and we have been really impressed with the children's use of descriptive features to highlight the character's feelings. The children have also enjoyed their first PE session- don't forget both PE lessons will now take place on a Tuesday. Please see the top of the blog for 'Meet the Teacher' slides, as well as this half term's homework grid and topic web. Please note: Ambassador letters have also been sent out. What a fantastic start to the new term! Can you believe the children are in year 6 already? We’ve had a jam-packed week of ‘getting-to’know-you’ activities as well as some introductory English lessons and art. In English, we will be basing our learning around ‘Kensuke’s Kingdom’ by Michael Morpurgo. So far we have read the first chapter, making predictions about the plot. The children have also learnt about the inspiring individuals behind their new class names and have thought about how they can develop their own growth mindsets for learning. Create a logo that represents you! This needs to be approximately A5 sized and neatly presented. It can either drawn by hand or produced on the computer. Due on Tuesday. Please note, the children will be given homework diaries and we would like parents/carers to sign these weekly on a Friday to be returned to school Monday. Thank you in advance for your support. We hope you have a lovely weekend and look forward to seeing you at our ‘Meet the teacher’ meeting on Wednesday at 3:45pm. Online system opens for you to apply online. Find individual school details in the schools directory. Deadline to apply for a school place. and for it to be considered ‘on time’ in the allocation process. To retain your continuing interest for a Hertfordshire upper or studio school or UTC, you will need to make an in year application. To retain your continuing interest for a Hertfordshire secondary school you will need to make an in year application.